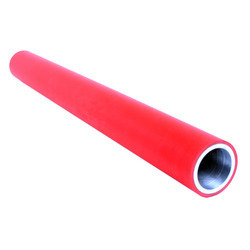 Our range of products include polyurethane concave rollers. Roller Diameter (meters) up to 3"
Polyurethane Concave rollers offered can be made available by us in both standard as well as custom configuration choices including offering precision molding support as per the defined specifications. Further, the superior construction finish of these rollers also provide for high impact resistance and optimum performance flexibility. Some of its features include provide for noise reduction; offering high resistance to low temperatures, oil, ozone, radiation issues; come with overall length & outer diameter of up to 3"; shore hardness properties of 40A to 75D; can be provided with support of different hub materials like of aluminum, steel, sintered bronze, brass and others; high temperature & heat resistance; rollers designed to withstand tough working conditions without compromising on performance parameters.